China's passenger car sales grew rapidly in July. Shown are workers at Anhui Jianghuai Automobile Co. Ltd. in Hefei. BEIJING (Bloomberg) -- China’s passenger-car sales grew at a faster pace in July as the government introduced subsidies for fuel-efficient models and dealers offered discounts to clear inventories in the world’s biggest automobile market. Retail sales of cars, SUVs and multipurpose vehicles rose 15.4 percent from a year earlier to 822,300 last month, the China Automotive Technology & Research Center said today. That compared with 10.9 percent growth in June, 25 percent in May and 34 percent in April, when the center began releasing statistics. Auto dealers stepped up incentives to lure customers after demand began growing at a slower pace in April amid higher inflation and easing economic expansion. The government also began offering subsidies of 3,000 yuan ($443) to promote purchases of fuel-efficient models. Rising inventories may lead to weaker sales growth in August, the center said in today’s statement. Vehicle inventories rose in July, pushing dealers to offer discounts. The average stockpile period, a measure of the time between car production and registration, lengthened to 58 days from 55 in June, according to the center. 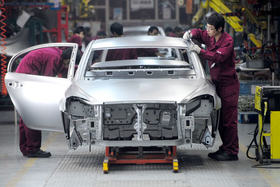 Domestic auto output exceeded sales by 1.29 million vehicles in the first half of this year, the center said on July 5. Automakers may join dealers in offering discounts in the fourth quarter, Cheng Xiaodong, an official with the National Development and Reform Commission, said on July 23. China’s car prices fell 1.2 percent in the first half from a year earlier, according to the agency. Vehicle prices may decline steadily in the second half of the year because of pressure by wholesalers to meet sales targets, the planning ministry said on July 23. China’s car sales, which have risen every month since February 2009, began growing at a slower pace in April, according to wholesale data from the China Association of Automobile Manufacturers. Weaker economic growth and rising prices for food and housing are discouraging some consumers from visiting showrooms, contrasting with last year, when rising incomes and government subsidies spurred a 46 percent surge in vehicle sales. China’s inflation may have accelerated to 3.3 percent last month from 2.9 percent in June, Morgan Stanley said on July 28. The nation’s manufacturing contracted for the first time in 16 months in July, according to a survey of purchasing executives released today by HSBC Holdings Plc and Markit Economics. Economic growth dipped to a 10.3 percent annual pace in the second quarter from 11.9 percent in the first three months of the year as the government tightened credit to reduce the risk of overheating in the world’s fastest-growing major economy. The government boosted the sales tax on small cars to 7.5 percent this year after halving it to 5 percent last year. The tax cut helped vehicle sales surge to a record 13.6 million in 2009. Carmakers including General Motors Co. and Honda Motor Co. are still counting on rising Chinese sales to help offset falling demand in Europe and a slowing U.S. recovery. Full-year auto demand may rise 17 percent to 16 million, the State Information Center said in April. “Even if annual sales growth comes down to 20 percent, it’s still a very good rate,” Daiwa Institute’s Xia said. Honda, Japan’s second-largest automaker, raised its full-year profit forecast last week citing higher-than-expected sales in Asia excluding Japan. The Tokyo-based company boosted its fiscal-year sales estimate for China by 30,000 vehicles. GM sold 1.21 million vehicles in China in the first half of this year, surpassing the Detroit-based carmaker’s U.S. deliveries for the first time in the company’s 102-year history. Total auto sales in China, including trucks and buses, increased 17 percent from a year earlier to 1.06 million vehicles in July, the center said.